I recently went power washer crazy, and I’m never going back. My home hadn’t been painted in at least 25 years. It was time. But to be sure the new coat of paint would stick, it was necessary for me to first wash the siding to clean away all the old, chalky paint. I could do it with a scrub brush and harsh chemicals, and days-worth of hard work. Or, I could get a power washer and do the job with plain water in a fraction of the time, and actually have fun doing it! As it turns out, not only did the pressure washer get the siding cleaner than hand scrubbing, it actually spurred me to other jobs. After all, since the house was now so clean, I couldn’t ignore that grungy sidewalk. In an hour’s time, the 50-year-old sidewalk looked like new concrete. So, I popped on the soap nozzle and washed the cars, too. I finished my day by pressure washing the barbeque grill in no time at all. The steaks that night never tasted better. Now I have the cleanest property in the neighborhood! Since I bought my gas power pressure washer, I can’t imagine how I lived without it. Add the best gas power washer to your cache of home maintenance tools, and you will be amazed at how many uses you find for it. We have been researching and reviewing the gas power pressure washer market for years. There is a lot to know. They come in a wide range of sizes and capacities. It can get daunting to figure out just which of the top rated gas power washers is right for your needs. To arrive at our Top 10 Best Gas Power Washer list, we have done about 60 hours of research, and compiled a sufficient amount of community-based usage reviews, along with personal testing. Our research does not focus on or promote any particular brand. Rather, our goal is to help you figure out which are the best power washers on the market. This list offers some options, depending on your needs. If you are looking for the washer with the best sale price, we’ve got that. If you are looking for home or industrial use, you can find a winner in our list, too. And if you are looking for the best gas power washer, well, of course, we have it figured out for you. Why Do You Need a Gas Pressure Washer? Let me count the ways that a gas powered washer will make life better – Five! Stuffoholics comes up with five key benefits. Remember that house washing job that I was facing? It would have taken me at least 5 days to do the job with a bucket and brush. I would have had to climb up and down ladders (with my bucket and brush) dozens of times to scrub and then rinse the entire surface. With my gas power pressure washer, the job was done in a day. Washing the house by hand would have taken five times more water than I used with the power sprayer. Here’s the math; The garden hose pumps out about 8 gallons of water per minute at roughly 60 psi of pressure. The pressure washer uses about 1.6 gallons per minute at 1500 psi. That’s five times the cleaning power and one-fifth the amount of water. My water bill would have been five times higher had I scrubbed by hand. Hire someone to do the job? Forget it. You are going to pay him more in one day than the pressure washer will cost, and it will be ready to clean for you again and again for years to come. There is simply no doubt that the powered sprayer gets things cleaner than you can ever do by hand. It’s not even a contest. The before and after photos of my own home are all the proof I need of that. You may not notice the dirty driveway or sidewalk, because it matches everyone else’s in the neighborhood. But look at the home that has a beautifully clean walkway and it stands head and shoulders above the others. I’ll admit it. Watching the dirt and grime melting away from outdoor surfaces is addictive. This is so much fun that many even consider stepping into the power washing industry. I started on my siding. Then I did the walkway, the driveway, the back patio, the outside basement steps, the house foundation. I couldn’t help myself. If I see dirt, I want to spray it away. There are two main parts to a power washer that define just how much cleaning muscle it has. The first is the engine size. The second consideration is the water pump. A larger gas engine generates more power. Engine size is measured by the volume of the combustion chamber. The ten top-rated units in our list have engines ranging from a low of 140 cubic centimeters up to 212 CC’s. In general terms, the more power an engine can generate, the higher the pressure output of the sprayer will be. Another benefit is that a larger engine doesn’t have to work as hard to achieve the same result as a smaller engine. This can contribute to a longer engine life. The second consideration is the water pump. The pump takes in that low-pressure water from your garden hose and pushes it through a much smaller valve at incredible force measured in pounds per square inch, or PSI. A second important consideration is the amount of water the pump forces through, typically measured in gallons per minute, or GPM. When you shop for the best gas power washer, these terms can get confusing. Which is better – a system that generates 3100 psi and uses 3 gallons per minute, or a 4000 PSI sprayer that unleashes 2.325 GPM? Stuffoholics answers that question with a little math. To determine the cleaning power of a given pressure washer, we multiply the PSI by the GPM to arrive at what we call Cleaning Power Units, or CPU’s. In this example, the answer is that these two units provide identical cleaning power. From here, you can make the decision based on other features that meet your specific needs. There are two main designs for gas-powered washers. They are either direct drive or belt drive systems. Each has advantages and disadvantages. The type of jobs and frequency of use that you have in mind will help decide which is best for you. The most common design, especially on the more portable systems, is called direct-drive. The pressure pump is mounted directly on to the drive shaft of the engine. The advantage of this system is that there is no loss of power between the engine and the pump. It also has fewer moving parts and is a physically small design. The disadvantages of a direct drive pressure washer are that it tends to be a bit noisier and vibrates more. Extended use can also lead to overheating of the engine. A belt drive gas-powered washer is a physically larger machine because it has to accommodate the belt and pulley system to transfer energy from the engine to the pump. Using a belt significantly reduces the amount of vibration transfer between the engine and pump, resulting in a longer life for both. It also eliminates heat transfer between the engine and the pump. Both elements will run cooler, which means this is a design that can stand up to an eight-hour workday. The belt drive system is also the greatest disadvantage of this design. The pulleys and belt rob the system of some of its efficiency. They also need more maintenance and belts occasionally must be replaced. As we’ve already discussed; the engine size and pump pressure are two key elements to consider when selecting a pressure washer. But there are other things to keep in mind. In general, Stuffaholics recommends you look for the beefiest, most industrial design you can afford. Here’s why; A gas-powered sprayer has a tough life in a harsh environment. It deals with water, gasoline, dirt, vibration, and chemicals. If you are preferring a gas-powered washer over the electric type, look at the construction of the carriage. Is the frame made of durable steel parts? Does it have sturdy wheels capable of maneuvering over rough surfaces and through mud (yes, where there is water there will also be mud)? Consider the ease of use for each machine. Automatic features, like a unit that self-mixes cleaning solutions with the water, are worthy of consideration. Also, consider the size of the gas tank. Too small and you’ll spend too much downtime refueling. Too large, and you will be storing fuel in the machine for too long. Although some power washers on the market generate hot water, none of the machines in our top 10 use this technology. It adds another level of machinery to the system, and frankly isn’t necessary. Our top ten machines all create more than enough Cleaning Power Units to tackle any grimy mess you might encounter. Another consideration is how long of a hose do you need? Long hoses can be handy for reaching large areas without having to move the machine around. But they can also be a pain to deal with if they keep getting snagged on obstacles. Finally, consider the sprayer nozzles that come with the power washer you are considering. While other nozzles are available, the reality is that you will probably end up just using the ones that come with your unit. Who Are Gas Power Washers For? Anyone who owns a home or a car will find more uses for a power washer than they imagined. I bought mine for the single purpose of getting the siding on my house cleaner than hand scrubbing. Within a week, I had also power washed the sidewalk, driveway, two cars, and an old fence. It was a fence I had been considering replacing. But, after power washing and applying a new coat of stain the fence now looks like new! The time and money I would have spent on building a new fence were many times more than the cost of my gas powered washer, so the unit more than paid for itself with just that one project. Using a power washer isn’t difficult and doesn’t require a lot of muscles, so anyone can use them. Many power washers even come with easy starting engines. Getting it ready to work can be as simple as attaching a garden hose and pulling a starter rope. Even if you just have a short stretch of sidewalk in front of your home, you have reasons for a portable sprayer. A sidewalk can get dirty with just a single rainstorm. Keeping it clean increases the curb appeal of your home. Once you have a power washer, you’ll never let it get dirty again. If you have cars, you have a ready-made reason to own a power washer. Modern car washes are harsh places for your car and you can spend as much as $50 dollars for a single car wash. Doing it yourself at home saves money and helps keep the finish on your car in great condition. Even if washing cars is the only thing you use your pressure washer for, you will still save time and money. Our search for the best gas power washer began by looking at 70 of the top rated units for sale today. That’s a wide variety of machines from many manufacturers. In all, we analyzed 46 different feature categories. That analysis brought us to the point of hands-on testing of about 50 machines. From this point, the selection process included practical testing data generated by a number of volunteers. Even the opinions of electric power washer experts and their personal choices were taken into account. Our volunteer testers focused on all of the same things you should look at when deciding which of these top-rated systems is best for you. They began by assessing the design of the machine, and the materials it was made from. They took into account the specifications of the motors. Everything from engine size to fuel tank volume was examined. The quality of water piping and the hose was a major factor. We also tallied the PSI, and GPM values to rate these machines based on their Cleaning Power Units. We studied things like automatic shutdown features, the design of the detergent tanks, thermal sensors, certifications, and even length of the warranty. The truth is, none of the machines we tested was flawlessly perfect, nor could they be. By definition, a power washer suitable for the industrial application may not be what you need for home use. But even at that, we did find pros and cons for every machine we tested. Our gas power washer reviews are based solely on this independent testing and analysis. We are not promoting or endorsing one brand over another. In fact, the machines on our top ten best gas power washer list are from half a dozen different manufacturers. Here is our top 10 list, based on that analysis of 46 key features on these machines. But even beyond our gas power washer reviews, this is information you can study for yourself. In the interest of total transparency, we have compiled this research into a document that we make available directly to you. We are attaching that report below so that you can see for yourself. Use this chart to make your own decisions about which features mean the most to you. The Simpson washer works equally well both in an industrial or home setting with its high CPU quotient, powerful Honda 197CC engine, 10-inch pneumatic tires, and sturdy welded steel frames. Before Stuffoholics jumps into our review of this awesome machine from Simpson, let me explain why it’s our best pick. Take a look at our attached research document, and you will see that the Simpson MSH3125-S has an amazing number of the 46 positive features by which we judged these machines. It simply washes the competition away. At 3100 PSI and 2.5 GPM, this easy to use power washer is an expert at washing away dirt, sun-baked grime and even mold and mildew from outdoor surfaces. The sprayer comes with 5 different tips to cover any cleaning chore you might be facing. The spray gun also has a great safety lock-out feature. Another way we confirm our choices is through the frequency of positive product reviews on Amazon. We compare the length of time it takes for the 30 most recent ratings to occur. Simply put, the faster a product collects good reviews, the faster it is selling and the happier its purchasers are. 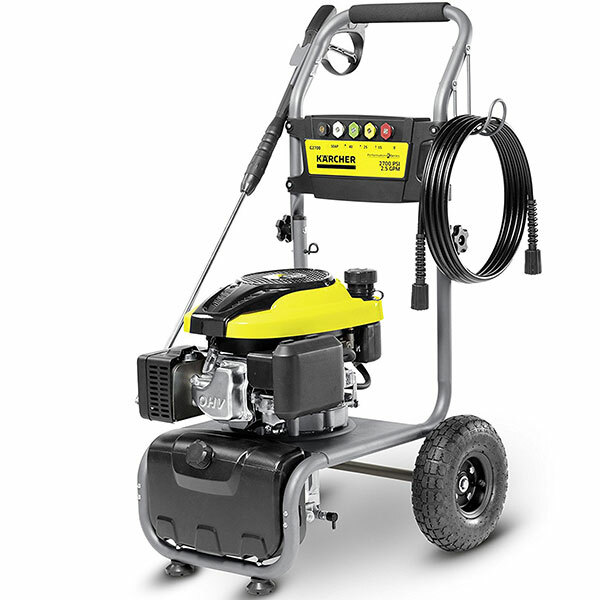 In our survey period, this pressure washer received its first ten ratings in 14 days. The second ten came in another 14 days, and the third set of ten reviews came in 20 days. The Simpson Cleaning MSH3125-S is a powerful machine at a very reasonable sale price. It’s easy to see why it tops our top 10 best gas power washer list. The axial cam pump, manufactured by OEM Technologies generates 3200 PSI at 2.5 GPM, giving this unit a Cleaning Power Unit (CPU) score of 8000. That’s more than enough for the dirtiest of tasks. It has a durable heavy-gauge welded steel frame. 10-inch pneumatic tires mean you can easily move this portable unit over any terrain with ease. The overall dimensions of this top-rated machine are 21 X 34 ¼ X 23 ¼ inches. It is a low-profile design that makes for easy storage when not in use. The machine comes with a 2-year engine warranty, a 1-year pump warranty, and a 5-year warranty on the frame. One of the best features of this power washer is the safety lock-out built right into the sprayer wand. This washer also has a siphon tube built into the pump, which automatically creates the correct ratio of soap to water, when using a cleaning detergent. The one thing it lacks is an onboard tank to hold that detergent. A small hose is attached to the siphon valve on the pump and the other end is placed into your own soap dispensing container. The system is designed to mix one gallon of detergent to every seven gallons of water. 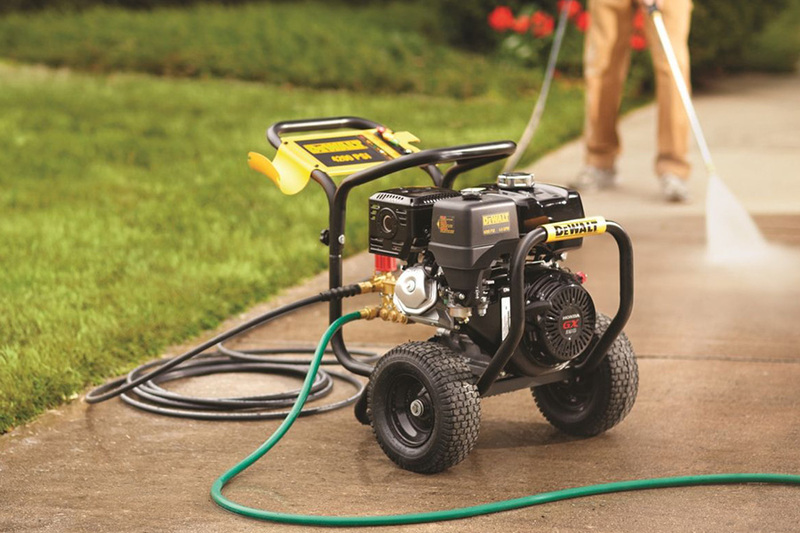 With a CPU score of 8000, this pressure washer stands out as one of the most powerful you can buy. It is equally suited for home use as well in industrial applications. This machine is durable enough to work as long as you want to. The Honda engine comes with their Easy-Start™ technology, designed to have the engine running with just one pull. The hose and cleaner wand utilize snap-on and -off M22 connectors for quick assembly and break-down for storage. The large pneumatic wheels make moving this 65-pound machine very easy for any user. The pump is designed to be maintenance free. The spray wand is a sturdy design that comes with 5 tips (0°, 15°, 25°, 40°, and soap applicator) to handle any cleaning chore with ease. The high-pressure hose is a ¼” by 25-foot “Morflex” hose designed to be kink-free and abrasion resistant. The nozzles, hose, and wand all have onboard storage locations built right into the design of the machine. Whether you are using the SIMPSON Cleaning MSH3125-S in an industrial setting, or just washing cars, no machine will get things cleaner than this one. Stuffoholics especially likes the over-sized pneumatic tires that make this machine portable over any terrain. It’s high CPU quotient and powerful Honda engine mean you can get your cleaning job done faster and with less fuss. With a sale price in the $400 range, this machine is almost perfect for any power washer application. Why is this product our Runner-Up? This pressure washer is a very capable power washer that can take on even the heaviest industrial uses, with its powerful 3300 PSI pump, strong steel frame, and a beefy warranty for its engine, pump, and frame. Simpson Cleaning also takes the runner-up spot in our top 10 best pressure washer list with another great entry. It has a long list of positive features that put it ahead of most pressure washers on the market. This machine actually has a slightly more powerful engine and a higher PSI than our top-rated machine. It also received Amazon reviews at one of the highest frequencies of any machine on our list, although not as high as our top pick. This is a very capable power washer even for the heaviest industrial uses. The main reason this machine comes in second place in our top 10 best pressure washer list is cost. With a sale price in the $530 range, it is the most expensive of our top-rated machines. This pressure washer is equipped with Honda’s GX200 engine, a 196 CC powerplant that generates 6.5 horsepower. It will never have to work hard to do the job. The 3.3-quart fuel tank will keep this machine running for a very long time between refueling stops. The water pump is an AAA™ Industrial Triplex oil-cooled plunger pump that generates 3300 PSI at 2.5 GPM. This pump is maintenance free and very durable. The frame is made of tubular welded steel for a solid construction. This unit uses the same 10-inch pneumatic tires as our best-rated machine. It also uses the same low-slung, compact design for easy storage. The Simpson Cleaning PS3228-S also has the beefiest warranty in our 10 best gas power washer list. A 3-year engine warranty, 5-year pump warranty, and 10-year frame warranty is a chart-topper! This power washer has a siphon hose that can be repaired easily and put into a detergent bottle for automatic mixing of cleaner solution and water. The sprayer handle has Simpson’s safety lock-out design. The 3300 PSI nozzle pressure and 2.5 GPM water output give this machine a CPU total of 8250. That’s actually 250 units higher than our top-rated cleaner. There’s no doubt this machine will easily handle any clean-up job you can throw at it. With all attachments stored right on the machine, this power washer is very easy to use. The large fuel tank means you need to make fewer stops and can achieve your cleaning goals quickly. The high-performance output of the pump means you won’t have to do a second pass over, especially dirty areas to get them clean. A key added feature on this machine is the industrial grade water pump. It generates that high nozzle pressure because of a patent-pending technology called PowerBoost. Just like our top-rated pressure washer, this one has a durable spray wand with the safety lock-out feature. The 5 tips (0°, 15°, 25°, 40°, and soap applicator) are stored right on the machine for easy access. The 25-foot-long high-pressure hose has a 5/16” diameter to deliver that powerful 2.5 GPM water flow. A little larger and little more powerful than our top pick, this big brother from Simpson Cleaning is a heavy-duty, commercial grade pressure washer that is more than a match for any chore you can throw at this cleaner. But its strength may also be its greatest weakness. While this pressure washer can clean anything, it is also going to clean out your wallet. The sale price of around $530 makes it the most expensive unit in our top 10. On the other hand, if your needs call for a commercial-grade power washer, this machine will be worth the money. This upright washer is equipped with an onboard soap tank, 3100 PSI pump & water flow of 2.5 GPM, is very easy to use and has a noticeably longer hose – all for a very budget-friendly price. As you can see on our attached research report, this power washer from Wen is not the least expensive unit we considered. However, its high count of positive features and good consumer reviews make this portable pressure washer our budget pick. It boasts some great features. The 208 CC 4-stroke engine is never going to be outmatched by the task at hand. The 2.5 GPM pump that generates 3100 PSI is also among the best. Five nozzles and the longest hose in our top 10 also give this unit distinct advantages. That’s why we chose this entry from Wen as the Stuffoholics Budget Pick. The 208 CC 4-stroke engine has an overhead cam design, which gives it a powerful, long life. The engine carries the Wen name, which is a trusted brand for power tools. This machine uses an axial cam pump that generates 3100 PSI for a powerful result. The frame is steel tubing made in an upright design. The wheels are 12” solid wheels made of rubber with plastic rims. Although the large diameter helps, Stuffoholics finds these wheels to be a bit narrow when contending with soft ground made muddy by the run-off from power washing. Wen is a solid manufacturer of power tool products and has a good reputation for standing behind their products. This pressure washer comes with a customer service telephone number and a two-year warranty. Most notably, the Wen PW31 is equipped with an onboard soap tank. If your task calls for a little more cleaning power than straight water, just put your cleaner in the tank and the machine does the mixing for you. This is particularly handy if you are using the washer at a community car wash, for example, and you need to soap a lot of cars in a hurry. With 3100 PSI and a water flow of 2.5 GPM, this washer has a CPU rating of 7750. That’s plenty of cleaning power to handle anything. The Wen PW31 is very easy to use. The engine starts easily, and the hose and all of the attachments have quick-connect collars for easy set-up and tear-down. The hose wraps around a storage collar on the backside of the handle. A large diameter access to the soap tank is right on the front of the machine. The upright design of the frame is something that many users find handy. You can reach the handle and move the unit around without having to bend down to reach it. The nozzles are stored across a bar on the front of the handle, so they are also readily handy for changing. The lance is also 42-inches long, which is longer than most. That matters if your job is cleaning walkways or driveways. You can do the task without having to stoop down closer to the ground. The hose is noticeably longer on this system than on many others in our top ten list. Where a 25-foot hose is the industry standard, this unit comes with a 30-footer. That 5 extra feet of hose can make a big difference for jobs like flushing the gutters on your home. 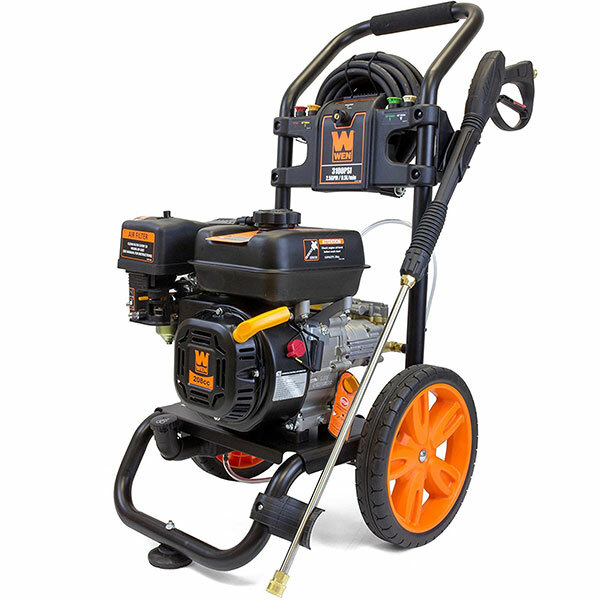 This gas pressure washer comes with 5 standard nozzles that never required any replacements. The very respectable CPU value and lowest price among our top ten make this model an easy call for Best Budget Pick. For the money, you simply can’t do any better. We like the onboard soap tank. We like the 30-foot hose. We like the cleaning power. We’re not as sold on the wheels. Although the large diameter helps, we would like to see wider tires that can handle being pulled through the mud and loose dirt more easily. Still, for about $240, this is a pressure washer worthy of your consideration. The Generac SpeedWash boasts of a vast array of high-quality attachments such as a soap nozzle and turbo nozzle, adjustable pressure settings & the highest CPU rating of 8640. When it came to picking the Stuffoholics Advanced Pick for a pressure washer, it wasn’t even a contest. This unit from Generac has some of the niftiest features you can imagine. And it’s the only machine in our test that offers them. More power, 6 advanced design nozzles, and an adjustable power dial right at your fingertips on the ergonomically designed spray gun. Now add the incredible power broom attachment, and you have a pressure washer that stands alone in our field. At about $450 dollars, it is one of the more expensive units in our top 10, but it delivers amazing value. Powered by a Generac 196 CC Overhead Cam engine, this unit will never run out of power. The pump is an axial cam pump with a brass head. The company says brass pumps generally last about twice as long as aluminum pumps. The frame is tubular steel made in sections that bolt together. Not the strongest design, but it should do well. The wheels are narrow plastic wheels that, as we’ve discussed already, are not our favorite design. They are great if you only plan to use your pressure washer on solid surfaces. But if your task involves, say, washing a fence where the unit will be sitting on the ground, the narrow wheels can lead to creating some muddy tracks across your lawn. Generac includes a two-year warranty for parts and labor and adds a third year for limited parts only. This pressure washer includes a large tank down low on the front for the automatic detergent dispensing system. 3200 PSI and 2.7 GPM gives this unit a Cleaning Power Units measurement of 8640. That’s one of the highest ratings of any of our tested units and speaks for itself. This pressure washer is as easy to use as any of the units on our list. The biggest problem you will have is in deciding which of the many attachments you want to use. There are so many ways to use this machine that it’s almost overwhelming. The system also has a 30-foot hose to help you make long reaches with ease. And if you find any problems with this hose, you might be able to fix it yourself. This is the category where the Generac Speedwash 7122 really stands out. It has four amazing features that you simply won’t find with any other unit. For starters, the PowerDial™ allows you to adjust the amount of pressure right at the handle. It has settings for car, wood, concrete, and soap, all right where you hold the wand. It also has two unique nozzles. The soap nozzle is a high-pressure unit that sprays soap three times farther than other soap nozzles, for deeper and more complete coverage of the area you are cleaning. If you need to clean concrete or bricks surfaces, the turbo nozzle emits a rotating pinpoint stream that just forces the dirt away like no other nozzle. Stuffoholics has used these nozzles and they are simply amazing. Finally, the unique power broom is like nothing any other pressure washer offers. It is a 12-inch scrubber equipped with high-pressure nozzles to clean decks and concrete surfaces like nothing you’ve ever seen before. In case you haven’t figured it out yet, Stuffoholics really likes this Advanced Pick from Generac. There is a lot to love here. While the basics of this pressure washer are not much different than many of the other top brands, it’s terrific CPU rating and an assortment of outstanding attachments mean this machine will give you cleaning options that other washers can only dream about. The only things that would make this pressure washer perfect are a welded steel frame and better tires. But when it comes to cleaning ability, this system can’t be beaten. Why is this product our Compact Choice? The Karcher is best for those who live in small spaces with its compact size, small footprint, and folding handle feature. It has pneumatic tires for easy transport, and 196 CC engine that delivers serious cleaning power. The Karcher G2700 is our best compact choice because it comes in a small footprint design for easy storage. It also weighs only 48.5 pounds, making it the most lightweight unit on our top 10. But small size doesn’t mean small cleaning power. At 2700 PSI and 2.5 GPM, this diminutive unit still manages to deliver serious cleaning power. It comes with the standard 5-nozzle quick-connect set, so there’s no sacrifice in options. As a bonus, the upright design and folding handle mean that storage is a breeze when the unit is not in use. The Karcher 196 CC engine has a vertical shaft design, meaning the pump is mounted below the engine, underneath the frame of the unit. It is an axial cam pump with an aluminum head. As we have mentioned before, brass heads generally last longer than aluminum ones, so be aware of this issue. It basically means that you can expect a shorter lifespan for this pump. This pressure washer has pneumatic tires mounted on metal wheels, which is our favorite for ease of use and durability. The tubular steel frame is bolted together. Not the best, but lightweight and still fairly durable. This pressure washer is equipped with pneumatic tires that allow you to move is easily over grassy surfaces and upstairs with ease. This is a definite positive e feature of this machine. The spray wand has a child safety lock, which is something Stuffoholics highly recommends. There is also an onboard detergent tank to make using cleaning solutions very easy. The Karcher G2700 generates 2700 PSI at 2.0 GPM for a CPU rating of 5400. That is significantly below the highest rated units in our list. What this means is that you will be able to get things just as clean as with the larger units, but you may have to go over the same areas two or even three times to achieve it. In the end, you will invest more time and effort to accomplish the same result. This is a very easy machine to use and you can get even better results with some pressure washing tips and tricks. The downside is that there are very few special features to consider. It is a basic pressure washer. One of the best features of this pressure washer is the folding handle. If storage space is at a premium for you, this machine is worthy of consideration. Just fold the handle down, and it can be easily stored on a shelf in the garage or basement. This pressure washer comes with the standard five nozzles and little else. Owing to its economy stance in the pressure washer category, the machine is good but basic. If you live in a Townhouse or other home with a fairly small footprint, this is a great machine for you. It will be able to tackle small, repetitive jobs without problem. Best of all, the folding handle means you can stow it away in a very small space. Don’t underestimate this. For a machine that may only be used a few times a year on small jobs, this portable gem might be just the ticket. For around $270 dollars, it’s a good deal. The Excell is a relatively generic brand, yet its 3100 PSI rating at 2.8 GPM delivers a chart-topping CPU rating of 8680, way above the rest of the washers on this list. It also has a thermal relief valve. The Excell brand name is not particularly well known in power tools, and that may be the biggest drawback this unit faces. Still, this power washer has some good things going for it that allow it to land at number 6 on our top ten best gas power washer list. It has a large engine and a powerful 3100 PSI rating, which means it will tackle most cleaning jobs with ease. The 212 CC Overhead Cam engine carries the Excell brand name but should be able to handle the task at hand just fine. The engine meets EPA and CARB emission standards. This unit does have an axial style pump with stainless steel pistons and a brass head with thermal relief. Thermal relief means that if the pump gets too hot, it allows cold water to run through the pump and directly out a relief valve to cool the pump down. This is a great feature designed to prolong the life of the pump. The frame is tubular steel with a low-profile design. The wheels are 10-inch never-flats that are a bit wider than most solid tires. The hose is a fairly standard 25-foot length. With a 3100 PSI rating at 2.8 GPM, this unit boats a chart-topping CPU rating of 8680! There is performance to spare with this unit. There is nothing particularly difficult about this machine. The features are fairly standard, with five common nozzles, and a basic wand design. This pressure washer comes with the standard 5 nozzle set that nearly all of the machines on our list have. The wand has a safety lock-out and an ergonomically-shaped handle that is comfortable to hold for long days of power washing. This gas powered washer stands out for a couple of reasons. It has the highest GPM of any machine on our top 10 list, which results in the best CPU tally. Stuffoholics also really likes the thermal relief valve on the pump. Pumps are usually the first part to fail because creating the pressurized stream of water generates a lot of heat as a byproduct. When it gets hot it can lead to the pump seizing up. The thermal relief valve lets cold water wash the heat away. At around $300, the price range falls squarely in the middle of our research. Despite its generic brand engine, this best gas power washer deserves a look. This power washer is the little brother of our Advanced Pick, comes in an upright design, and boasts of an onboard detergent tank, 196 CC OHC Generac motor, a padded handle on wand and a two-quart fuel tank. 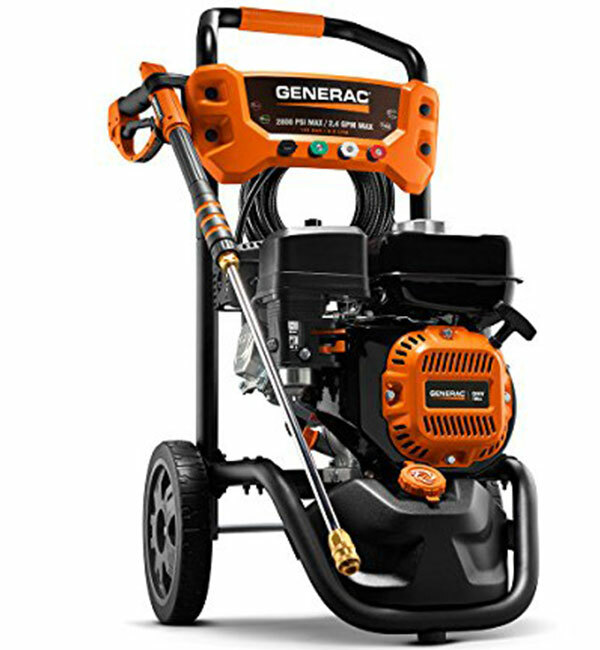 This pressure washer from Generac is a smaller, less powerful version of our advanced pick. It has a few nice features but does not have the cleaning power of most of the units on our top ten list. The engine is a Generac-branded 196 CC OHC, so there is plenty of power. It has a two-quart fuel tank. The axial cam water pump is a rearward facing design for easy-to-reach hose connections. The frame is a tubular steel upright design and has narrow 10-inch wheels that we don’t like. Generac supplies this machine with a two-year warranty. This pressure washer does have an onboard detergent tank in an easy, upfront location. Here is where this pressure washer is a bit of a letdown. The pump creates a below-average 2800 PSI at 2.4 GPM which gives the unit a relatively low Cleaning Power Units measure of 6720. That’s enough to get the job done but is one of the lowest scores in our top ten. The padded handle on the wand is a nice touch. It means you can use this machine for a long time without suffering the hand fatigue that comes with squeezing the trigger for hours on an uncomfortable wand. A bit disappointing here, as well. Where most of the machines on our list have 5 nozzles, this one comes with only 4. Yes, they will do the job if you know how. But we like options. The low CPU, modest frame, poor wheel choice, and low nozzle count don’t add up to a choice we would make. When you put this machine next to the Generac SpeedWash 7122, it absolutely pales in comparison. This machine does cost about $150 less. But the features that it doesn’t have leave us to think this machine should be passed over in favor of its big brother. 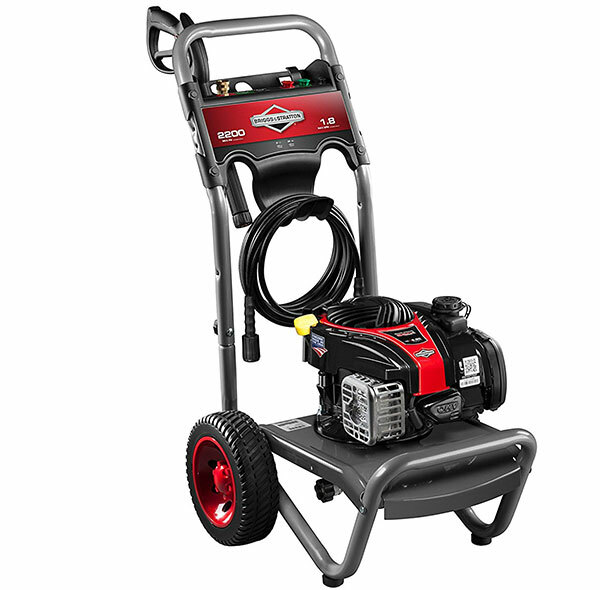 The Briggs & Stratton power washer has a high-quality and durable engine, and boasts of the Easy Start technology, making it one of the most user friendly power washers in the market. The Briggs & Stratton name has been synonymous with small engines for over a hundred years. Aside from that, however, this budget-friendly power washer is quite basic. The engine is a fairly small 140 CC power plant with a vertical shaft design. It does carry the Briggs & Stratton nameplate, which means you can trust this engine to be durable. Because of the vertical drive shaft, the axial cam pump is located underneath the baseplate of the frame. This keeps the water elements of the system low to the ground, but it also means you have to get down underneath the machine to attach the hoses. Speaking of hoses, the sprayer attaches to a longer than average 30-foot hose. This machine leaves us a little cold when it comes to the performance ratings. With a pump that only generates 2200 PSI at a flow rate of 1.9 GPM, the resulting Cleaning Power Units tally of 4180 is the lowest on our top ten list. The engine boasts Easy Start™ technology and is likely one of the most user-friendly powerplants of any machine on our list. The hose connections located under the baseplate are awkward and difficult to access. Wide, solid wheels mean this machine will easily roll over any surface. This power washer only comes with 3 nozzles, 0°, 25°, and soap. If you want to add detergent to your water stream, it is done by way of a siphon hose. There is no onboard soap tank. If you want a power washer that carries the Briggs & Stratton brand name, Stuffoholics can certainly appreciate that. Their status in the small engine world is legendary. Beyond that, however, we just don’t find much about this machine that would make us choose it over other pressure washers in our list. This Simpson washer features a high-quality Kohler engine that meets EPA & CARB emission standards. It has a simple welded frame with durable construction & an excellent cleaning power unit of 7440. 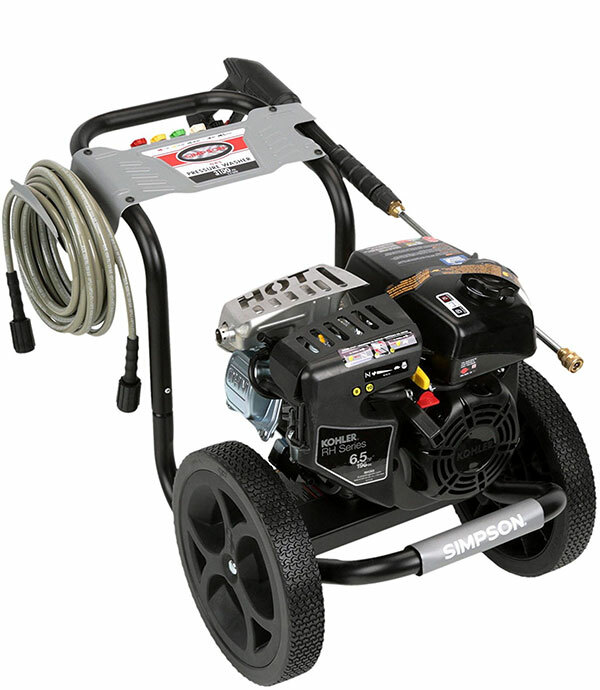 This is Simpson’s third appearance in our top 10 best gas power washer list. It shares some of the great features of our list-toppers but paves its own way in other regards. 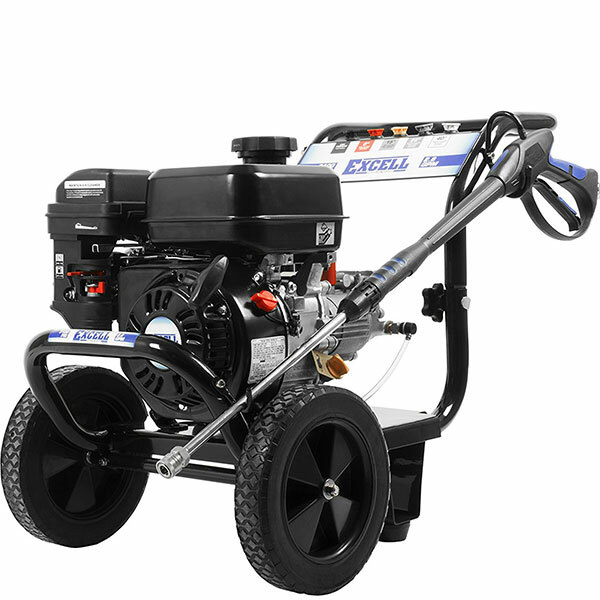 This pressure washer is equipped with a 196 CC Kohler engine which is another well-known engine maker. It meets EPA and CARB emission standards. The axial cam pump is an OEM Technologies product. It has a thermal relief system that allows a cold-water flush when the pump gets hot. The frame is simple in design but the welded steel construction is as durable as can be. The 12-inch solid core wheels aren’t as good as the pneumatic tires the other Simpson models have, but they are adequate. The warranty is one year for the pump, two years for the engine and five years for the frame. It does provide for a siphon hose to be dipped into a detergent bottle for automatic mixing of soap and water. There is not an onboard soap tank. This pressure washer generates 3100 PSI at 2.4 GPM for an excellent Cleaning Power Unit score of 7440. This is a fairly simple point-and-spray pressure washer. The wand does have a safety lock-out feature to prevent accidental trigger pulls. The standard set of five nozzles have onboard storage spots. 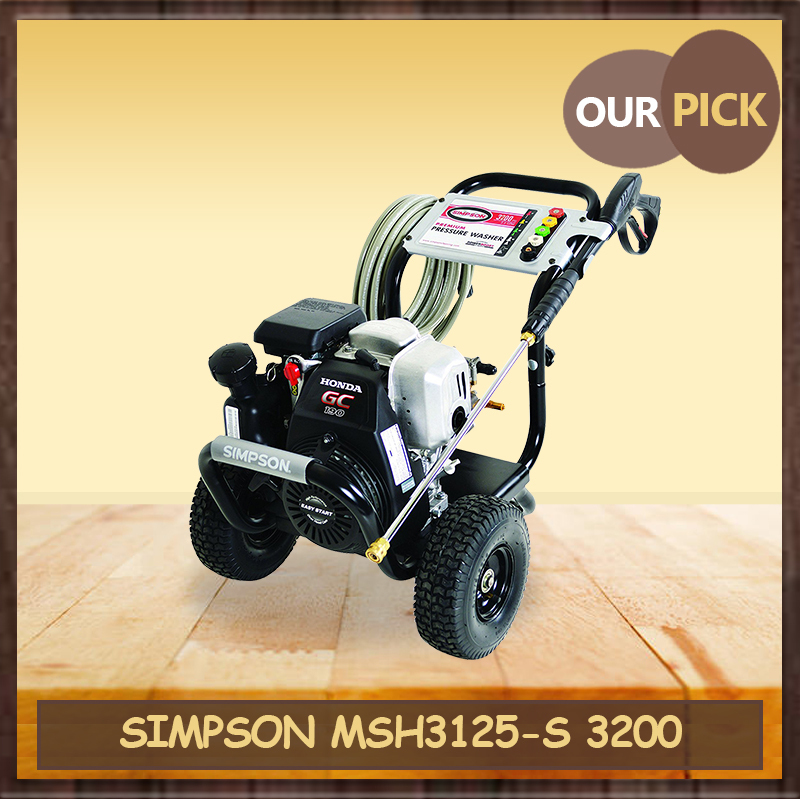 This is a lower cost offering from Simpson than the pressure washers that claim first and second place on our list. But with a good engine, a very respectable CPU score and a sturdy welded steel frame don’t overlook this one. The point of a pressure washer is to get the job done, and Stuffoholics has no doubt this machine can do just that. Along the way, its lower sale price will keep a little extra green in your wallet. This washer has a strong motor-pump combination with its Honda engine and a maintenance-free axial cam pump resulting in high CPU score & the Easy Start technology that makes it user friendly. This pressure washer generates a lot of cleaning power, owing to its Honda engine and powerful pump. But it is lacking in a few other areas that comparably priced machines provide. The Honda motor is the same GC 190 model found on a few other pressure washers on our list. It also employs Easy-Start™ technology. The pump is a maintenance-free axial cam pump. The frame is a bolt-together tubular steel design. The engine is mounted on a simple steel plate that strikes us as a weak point in this design. Long-term vibration from usage has been known to generate cracks in lightweight plates like this one. The tires are semi-pneumatic and well designed. This pressure washer has a 2-year limited consumer warranty and a 90-day warranty for commercial applications. So the manufacturer is by your side if you face any pressure washer problems. The pump generates 3100 PSI and 2.7 GPM for a CPU score of 8370. That’s good stuff. The Easy-Start™ engine design is user-friendly. The integrated detergent tank can hold an entire gallon of soap, so if your task calls for extra cleaning power, this machine will let you work for long periods of time between refills. This PowerBoss pressure washer only comes with 4 nozzles. We could probably get along fine with that. But what disturbs us is the way the nozzles are stored on this machine. Instead of being placed in holders on the frame, like every other machine in our survey, these nozzles are actually mounted in a holder at the end of the wand. That’s about as unhandy as we could imagine. A strong motor-pump combination gives this pressure washer a lot to be proud of. But the machine’s design breaks down when it comes to the frame that is likely the first fail point. It simply isn’t heavy duty enough to withstand the demands of power washing for hours at a time. This is a light to medium duty pressure washer. It’s fine for that level of work. But if you are a serious user, you should probably look higher on our top 10 best gas power washer list. We’ve thrown around a lot of terms in our gas power washer reviews. Let’s go over them carefully so you can fully understand all of the technical details. CC – This is the displacement of the engine. It is a measure, in cubic centimeters, of the volume of the combustion chamber inside the engine. In general terms, a larger displacement will yield a more powerful engine. GPM – The measure of how many gallons of water the pump will push through the hose every minute. PSI – The measure of how much pressure that water will be under as it reaches the nozzle on your spray wand. Higher pressure means more cleaning force. CP – A measure of the relative cleaning power to create an apples-to-apples comparison. The formula is to multiply the GPM with the PSI. Choosing the right pressure washer for you from the wide array of styles, prices, and manufacturers isn’t easy. That’s why Stuffoholics has created our top 10 best gas power washer list. It’s also why we provide you with our raw, unfiltered data set, so you can decide for yourself. Armed with all of the information we have provided, you can now make a decision. First, ask yourself what you need a pressure washer for. Washing the driveway, sidewalk, home foundation, siding, cars? Arriving at your expected uses will give you a big clue as to which features are important to you, and how much power you will be asking for from your machine. Our own experience suggests that once you decide what you will use the power washer for actually just scratches the surface. We intended just a single use for our own machine, and within a week’s time had found half a dozen more uses. So be sure to buy a bit more machine than you think you need. What type of pressure washer do I need? This list explores gas power pressure washers, but there are others. Many of these same companies also sell electric powered washers. In general, these are smaller, less powerful systems with a more limited service time per day. They can get very hot and often have automatic shutdown cycles to allow the motor some cool-down time. A little bit of maintenance goes a long way to preserving your pressure washer for years to come. But ignore these tips and your machine could be in jeopardy of failing very quickly. The most important thing is to make sure the pump is free of all soap and water before you store it away. Remove any remaining soap in the tank or siphon tube and run a long stream of clear water through the pump to wash out any soap residue. Don’t allow water to remain inside the pump. This is critical. That water can lead to corrosion inside the pump, and the next time you try to use it, you may find the pump piston is completely frozen. After flushing the soap, unhook the water supply hose and flush the pump using a can of pump lube, which you purchase at the same place you bought your pressure washer. It’s a simple five-second procedure that can save you hundreds of dollars. Be sure to mix in the appropriate amount of fuel stabilizer to the gasoline. Unstable gas will lose its power and gum up the tiny carburetor on your engine. Also, be sure to give the engine regular oil changes according to the manufacturer’s specifications. One final maintenance tip. Put a little silicone plumber’s grease on the O-rings of the nozzles. This will allow the quick connect connections to retain a nice, smooth connection and also help to preserve the rubber O-rings themselves. A gas power pressure washer is a tool that you may think you wouldn’t use very often. But once you have one in your workshop, you are going to be surprised at how often you put it to use. You will wonder how you ever lived without it. From simple little jobs like washing the car to the big ones like washing the siding on your home, there is no better way to get it done. You might think that occasionally renting a unit will be sufficient. Don’t bet on it. Getting a power washer from the rental store to your home and back is a lot of work and you’re likely to end up getting dirt and water, maybe even gasoline spilled in your vehicle. It’s so much easier to just roll it out, do the job, and put it away. You’ll find yourself doing this more than you think. The result of all of this power washing is that your home, deck, sidewalks, and driveway will be the cleanest in the neighborhood. It helps you demonstrate great pride in the place you call home, and people will notice.